Chinaplas 2019, with its aim to promote the plastics and rubber industries’ development by focusing on technology and creativity, offers an international platform for the release and exchange of information related to advanced new technologies. The show will feature more than 3,500 exhibitors, and will organize a series of exciting concurrent events to address those industries’ needs. China’s decision to prohibit the import of solid waste from other countries, and its policies designed to promote development of renewable resources represent only the beginning of some structural changes. More sustainable development and environmental protection policies are bound to come. In this new era of the circular economy, China highly values the development of the renewable resources industry. What is more, recycling technologies are constantly evolving and improving, providing a boost to the industry. How can your company realize commercial opportunities related to the global trend of resource conservation in 2019? How can plastics feasibly contribute to the cause of sustainable development? Focusing on the concerns of the industry, Chinaplas 2019 and CPRJ – China Plastics and Rubber Journal will jointly host the “Plastics Recycling & Circular Economy Conference and Showcase” in Guangzhou on May 20, 2019. In addition to a series of concurrent events, there are more than 70 technical seminars at Chinaplas 2019. The organizer will also hold a number of activities extending to multiple application industries to help the industries grasp the current situation of the market. Chinaplas will be held in Guangzhou, China, from May 21-24, 2019. Andritz has received an order from Remondis Electrorecycling SAS to supply a complete recycling plant for refrigeration appliances to their dismantling center in Saint Thibault, France. 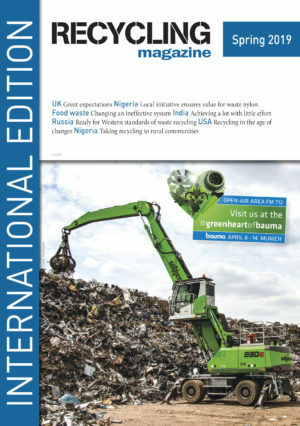 The Dutch Waste Management Association (DWMA), the Dutch Industrial Secondary Raw Materials Association for construction and civil engineering (VIB), the Dutch recycling federation FHG and the Swedish Recycling Industries’ Association (SRI) have announced their status as ‘Founding Friends’ of the Global Recycling Foundation, becoming some of the earliest donors of the foundation.